I really have a lot of fun finding old tools that I can use, rehabbing them and putting them to use. Last week, we were in Winthrop, WA and I found this little guy in a flea market store for $12. I took it home, cleaned it up and was able to read the stamp on it. 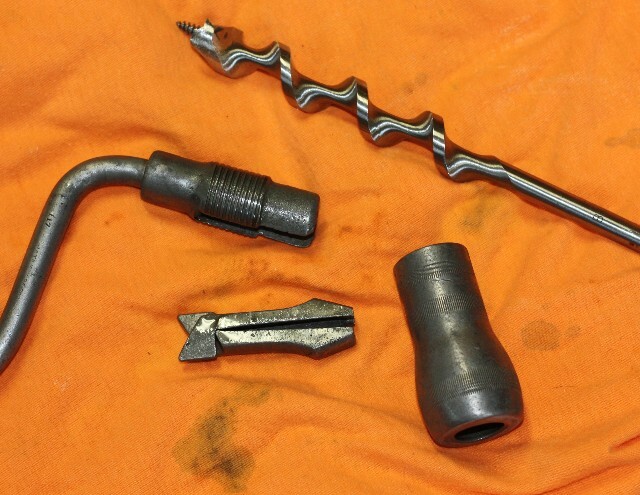 I also get a kick out of researching the story behind these tools and here’s what I found. 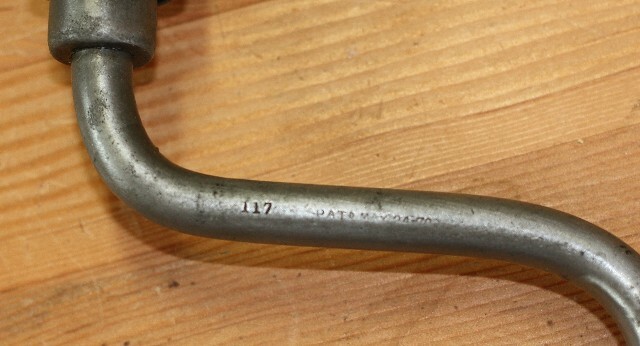 Hardwood head and handle; Bartholomew’s jaws. 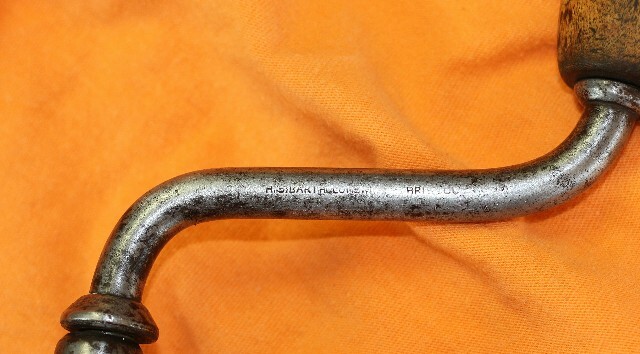 An inexpensive brace manufactured by the H.S. Bartholomew Company of Bristol, Connecticut, and sold by the Millers Falls Company. Features jaws patented by Harry. S. Bartholomew on May 24, 1870. In the early 1860s interest in devising new bitstock designs seems to have exploded, and about 100 new brace-related patents were awarded during the decade. One of the prominent brace inventers to emerge at this time was Harry S. Bartholomew of Bristol, Connecticut. Not immediately concerned with European Ball Brace chucks, Bartholomew was initially interested in ways to fit his braces with wooden wrist handles. 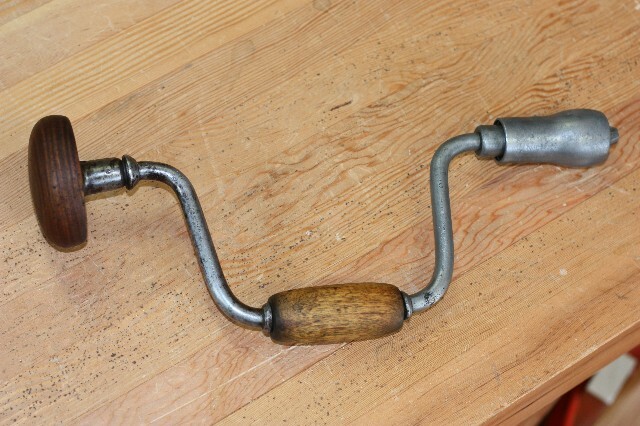 His early patents were for the idea of sliding a lathe-turned handle down an iron rod that had been fitted with a cup handle at one end, and then bending the rod above and below the wrist handle to form the bow of the brace. These braces tended to be small, were lightly constructed, and had a simple chuck with a side screw to fix the bit. Indeed, Bartholomew marketed them as “cheap” braces. The wrist handles were small and turned to very short, fat shapes. 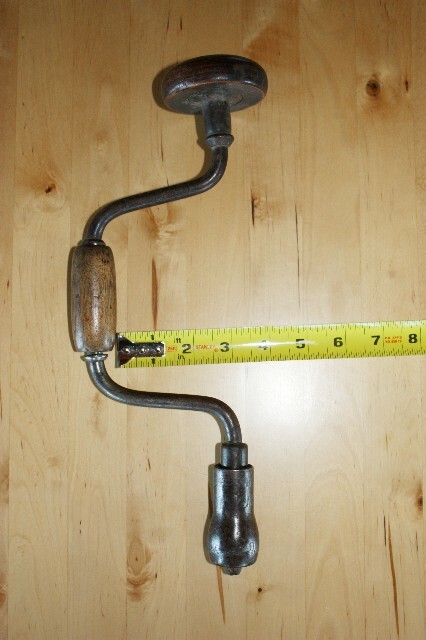 This entry was posted in brace, tool repair and tagged brace, tool rehab. Bookmark the permalink. ha ha, I’m glad there are others! I sometimes think my tool collecting is getting out of control. Bartholomew is an ancestor of mine, thanks for cleaning it up! If you ever decide to get rid of it id love to add it to the family collection! Ok, if you get a chance, send me your email. Mine is muthrie@gmail.com and if I decide to get rid of it, I will let you know.